(HARLINGEN) – Agriculture was a way of life for Daniel Agado, but he lost sight of it growing up. 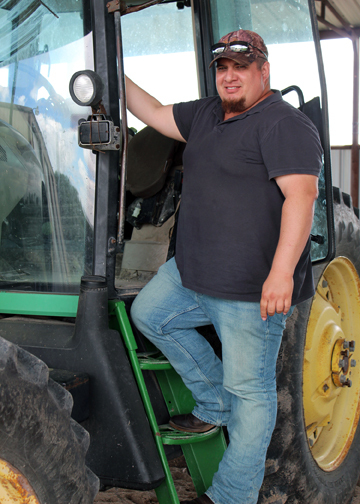 Years later, he has returned to his roots and is celebrating one month as the Agricultural Technology lab assistant at Texas State Technical College in Harlingen. The San Benito native said he always wanted to be a farmer as a young boy. Some of his earliest memories include driving a tractor when he was 8 years old; helping his grandparents and uncle plant and harvest crops such as sorghum, corn and cotton; repairing fences; and helping with animals. But after high school, feeling pressure to attend a four-year university, he enrolled at the University of Texas-Pan American (UTPA), now the University of Texas Rio Grande Valley, and pursued a bachelor’s degree in mechanical engineering. For a few years after UTPA, Agado worked odd jobs, none of which he considered lifelong careers. So he enrolled at a local community college to study biology. He ended up earning his associate degree from South Texas College in 2009, and later he transferred back to UTPA to pursue a bachelor’s degree in biology. With his bachelor’s degree nearly completed, Agado left UTPA and worked for nearly six years at the U.S. Department of Agriculture Service Center just north of Edinburg. He had worked part time at this location as a student. At the USDA, Agado served as a biology researcher studying beneficial insects and managing research farms in Weslaco. Agado enrolled in the Wind Energy Technology program at TSTC in 2016. Little did he know that not only was a degree waiting for him, but also a job-offer-turned-career. Agado earned his associate degree in Wind Energy Technology in Spring 2018 as a TSTC Board of Regents honors graduate with a perfect 4.0 GPA. Agado now assists TSTC Agricultural Technology department chairman and instructor Sammy Gavito and instructor Sheren Farag with their classes and labs. “We are so excited to have Daniel on our team. And I see him growing with TSTC and within our industry. The sky’s the limit for Daniel,” Gavito added. Come Spring 2019, not only will Agado continue his work as a lab assistant, but he will also be enrolled as a student in the TSTC Agricultural Technology program. He plans on pursuing an associate degree and later transferring to Texas A&M-Kingsville for a bachelor’s degree and teacher certification in Agriculture Science. For more information on Agricultural Technology, visit tstc.edu/programs/AgriculturalTechnology.